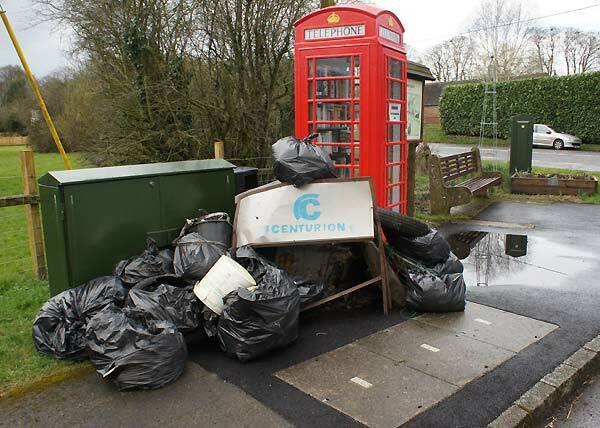 The area adjacent to the Phone Box on the A32 seems to have been targeted by the fly tipping brigade, but all is not what it seems at first sight. Don't worry, this isn't a permanent fixture The Council Refuse Lorry will be picking this lot up very shortly but all this effort really shouldn't be necessary. Why some people distribute their empty wrappers, bottles, food cartons and other rubbish around the countryside is beyond me. Surely it doesn't take much effort to put their rubbish in a litter bin where they are provided, or if no bin is available take it home with them and put it in the appropriate dustbin. Well done to all the pickers and, for the next few days at least, the Farringdon lanes and footpaths will be rubbish free.